Once upon a time, a young girl made her way through the forest to her Grandma’s house wearing a bold red hood and cape. Not one to miss subtleties, our heroine knew, just knew, that something was off with Grandma, who was tucked into bed and thus obscured by blankets and pillows. And well….we all know how that ends. Happily ever after, of course: the Big Bad Wolf gets his comeuppance, everyone is safe and happy and instantly famous, to be talked about for centuries to come. Now you can go on your own adventure in infamous style, wearing the same iconic bold, bright red hue and rocking the same eye-catching dress. C’mon, be a trailblazer, unafraid to make your own way to your own destination on your own time. 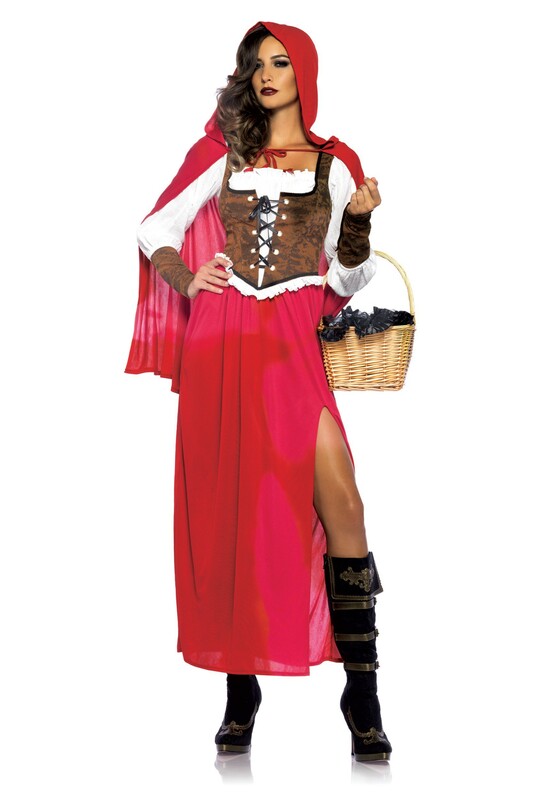 With this Women’s Woodland Red Riding Hood Costume, you’ll be able to march down the street or the forest lane, on your way to a comfortable fireplace where you can warm up with a cup of apple cider and delicious sweets at your grandmother’s house. Or you can help heat up your friend’s house party, whatever you fancy at this time of year. But dear, please remember the lessons that history has taught us when you don this outfit: check the eyes, ears, and teeth of all your friends and family members, because you never know where the wolf is hiding. In this dress, cape, and pair of velcro attached wrist cuffs, you’ll be the standout of the day and live Halloween ever after.